Oh, I think we’ve all got memories of clothes/hair/glasses embarrassments, Christine! Don’t tell anyone, will you, but I had a pair of ’80s bug-eyed glasses that dwarfed my face. What possessed me?! I had those, too! Not to mention enormous flares a bit earlier . . . When you’re young you just have to wear what everyone else is wearing, so we shouldn’t be too hard on ourselves. 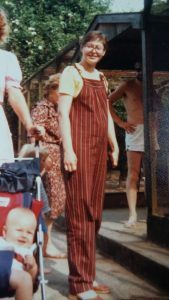 These were my only foray into the world of dungarees – and I remember them being a nuisance when you want a pee. Love that photo – I think you look like a certain type of street entertainer of the era, ready to do a bit of miming or juggling. I think we can be grateful that in our young days there were less photo ops and those awful moments were not shared so readily. Luckily no photos, but flashing before my eyes are the jade green flying suit and the shocking pink fake fur jacket I stomped through the 1980s in. When I turned 50 I did a display area at my party of ’50 years of fashion mistakes’ – photos and clothes and accessories – and people still mention them to me, the idea very much resonated I think…. What was it about the 1980s? Jade green flying suit! Wow! Yes, a brilliant idea for your party. 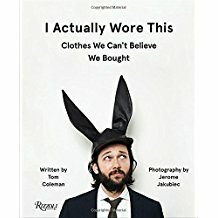 I intend to get hold of the actual book. There are some clothes though that I remember with affection . . .
A polyester midiskirt in white and navy diagonal stripes. The only good point about this outfit (circa 1973) is that I can’t remember the shoes. Lucy, that is truly horrible! Thanks for owning up.